For other uses, see Rhombus (disambiguation). In plane Euclidean geometry, a rhombus (plural rhombi or rhombuses) is a simple (non-self-intersecting) quadrilateral whose four sides all have the same length. Another name is equilateral quadrilateral, since equilateral means that all of its sides are equal in length. The rhombus is often called a diamond, after the diamonds suit in playing cards which resembles the projection of an octahedral diamond, or a lozenge, though the former sometimes refers specifically to a rhombus with a 60° angle (see Polyiamond), and the latter sometimes refers specifically to a rhombus with a 45° angle. The rhombus has a square as a special case, and is a special case of a kite and parallelogram. Every rhombus is a parallelogram and a kite. A rhombus with right angles is a square. The word "rhombus" comes from Greek ῥόμβος (rhombos), meaning something that spins, which derives from the verb ῥέμβω (rhembō), meaning "to turn round and round." The word was used both by Euclid and Archimedes, who used the term "solid rhombus" for two right circular cones sharing a common base. The surface we refer to as rhombus today is a cross section of this solid rhombus through the apex of each of the two cones. Opposite angles of a rhombus have equal measure. The two diagonals of a rhombus are perpendicular; that is, a rhombus is an orthodiagonal quadrilateral. Its diagonals bisect opposite angles. 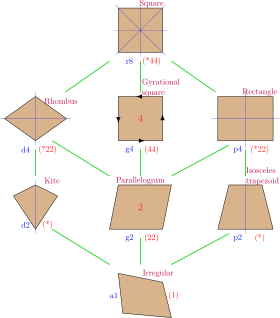 Not every parallelogram is a rhombus, though any parallelogram with perpendicular diagonals (the second property) is a rhombus. In general, any quadrilateral with perpendicular diagonals, one of which is a line of symmetry, is a kite. Every rhombus is a kite, and any quadrilateral that is both a kite and parallelogram is a rhombus. A rhombus is a tangential quadrilateral. That is, it has an inscribed circle that is tangent to all four sides. A rhombus. Each angle marked with a black dot is a right angle. The height h is the perpendicular distance between any two non-adjacent sides, which equals the diameter of the circle inscribed. The diagonals of lengths p and q are the red dotted line segments. 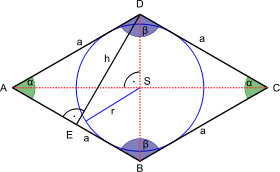 Another way, in common with parallelograms, is to consider two adjacent sides as vectors, forming a bivector, so the area is the magnitude of the bivector (the magnitude of the vector product of the two vectors), which is the determinant of the two vectors' Cartesian coordinates: K = x1y2 – x2y1. These formulas are a direct consequence of the law of cosines. A rhombus has all sides equal, while a rectangle has all angles equal. A rhombus has opposite angles equal, while a rectangle has opposite sides equal. A rhombus has an inscribed circle, while a rectangle has a circumcircle. A rhombus has an axis of symmetry through each pair of opposite vertex angles, while a rectangle has an axis of symmetry through each pair of opposite sides. The diagonals of a rhombus intersect at equal angles, while the diagonals of a rectangle are equal in length. The figure formed by joining the midpoints of the sides of a rhombus is a rectangle and vice versa. This is a special case of the superellipse, with exponent 1. 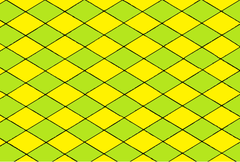 Identical rhombi can tile the 2D plane in three different ways, including, for the 60° rhombus, the rhombille tiling. Three-dimensional analogues of a rhombus include the bipyramid and the bicone. Several polyhedra have rhombic faces, such as the rhombic dodecahedron and the trapezo-rhombic dodecahedron. A rhombohedron is a three-dimensional figure like a cube, except that its six faces are rhombi instead of squares. The rhombic dodecahedron is a convex polyhedron with 12 congruent rhombi as its faces. The rhombic triacontahedron is a convex polyhedron with 30 golden rhombi (rhombi whose diagonals are in the golden ratio) as its faces. The great rhombic triacontahedron is a nonconvex isohedral, isotoxal polyhedron with 30 intersecting rhombic faces. The rhombic hexecontahedron is a stellation of the rhombic triacontahedron. 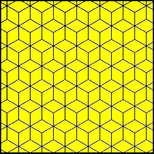 It is nonconvex with 60 golden rhombic faces with icosahedral symmetry. The rhombic enneacontahedron is a polyhedron composed of 90 rhombic faces, with three, five, or six rhombi meeting at each vertex. 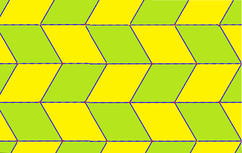 It has 60 broad rhombi and 30 slim ones. The trapezo-rhombic dodecahedron is a convex polyhedron with 6 rhombic and 6 trapezoidal faces. The rhombic icosahedron is a polyhedron composed of 20 rhombic faces, of which three, four, or five meet at each vertex. It has 10 faces on the polar axis with 10 faces following the equator. ^ Note: Euclid's original definition and some English dictionaries' definition of rhombus excludes squares, but modern mathematicians prefer the inclusive definition. ^ Zalman Usiskin and Jennifer Griffin, "The Classification of Quadrilaterals. A Study of Definition", Information Age Publishing, 2008, pp. 55-56. ^ Owen Byer, Felix Lazebnik and Deirdre Smeltzer, Methods for Euclidean Geometry, Mathematical Association of America, 2010, p. 53. ^ IMOmath, "26-th Brazilian Mathematical Olympiad 2004"
^ a b Weisstein, Eric W. "Rhombus". MathWorld. ^ de Villiers, Michael, "Equiangular cyclic and equilateral circumscribed polygons", Mathematical Gazette 95, March 2011, 102-107. Look up rhombus in Wiktionary, the free dictionary. Wikimedia Commons has media related to Rhombus. Rhombus definition, Math Open Reference with interactive applet.